Do you have your email marketing strategy in mind while you are writing to customers? After you have figured out what information you want to include in your emails, the next step to take is determining your target audience. Many marketers also make use of data mining, and, more specifically, market basket analysis to help carry out marketing tactics. Market basket analysis is a technique often used to predict relationships of activities performed by an individual. In retailing, it can be applied to understand the purchasing behavior of customers for purposes of cross-selling, up-selling, and sales and discount promotions. 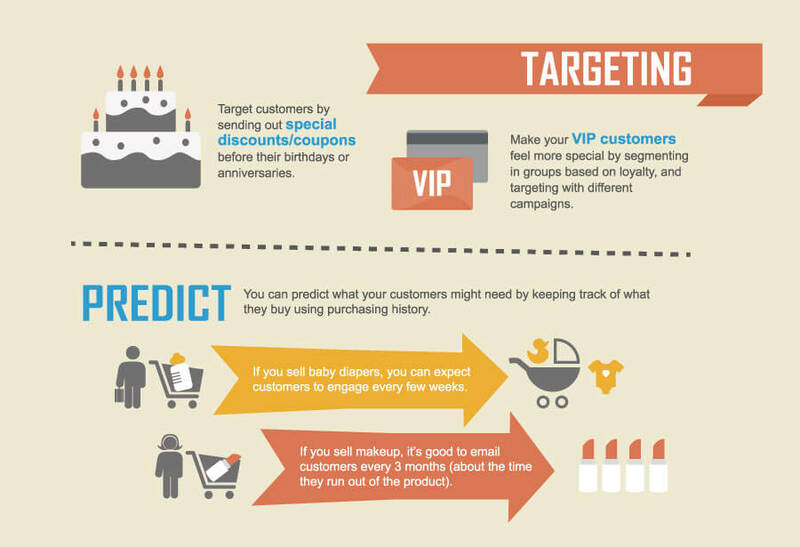 It can also be used for email marketing to forecast purchase behavior in order to know what types of promotions to send or what customer would also be interested in purchasing to encourage sales. If a customer has made repeat purchases for the same item, this data is useful to spot trends and discover opportunities for future promotions. For example, new mothers are likely to purchase diapers every few weeks and families, are expected to buy toilet paper once every 1 or 2 months. Likewise, if a customer with repeat purchase behavior has missed a routine purchase, you can send them an email to remind them that they might need to buy the item. Don’t forget to throw in occasional promotions and discounts to keep them coming back. Amazon is a classic example of implementing market basket analysis for their recommendation engines (“Customers who bought this, also bought…”). Online sellers can also adopt this idea and apply it to transactional emails. After a customer has made a purchase and you send them an email receipt, include complimentary products that they might be interested in purchasing. For example, if the customer has purchased headphones for their phone, you can recommend speakers or phone docks. Using market basket analysis for recommendation engines can also be applied for searching relevancy of future purchases to encourage more spending. If an expecting mother has bought baby clothes and baby supplies, you can expect them to buy baby toys in the near future. Use this information to send them a promotional email for baby toys. Speaking of sending emails to your customers, Feedback Central is a tool to help you work more efficiently and you are able to customize your email template to start e-mail marketing. It’s still not to late to start from now!